Recognizing the problem of finding a safe place to keep a bike, I established Cycle Garage in 1994. 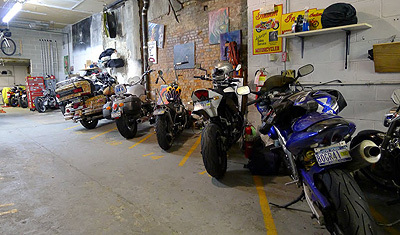 My goal was to create a clean, secure motorcycle and scooter only garage; a place for people who cared about their bikes to bring them indoors, safely away from the worries of street parking or public garages. Having kept a bike on the street for many years, I know what it is like, dealing with careless car drivers who knock over bikes and damage them, vandals who stole covers and slashed seats, and last but not least, parking tickets. I worried every morning that I would return to where I had parked to find my bike damaged, with parts missing, or GONE. I investigated commercial parking garages. Though they said they catered to motorcycles, they were often just as bad as street parking. 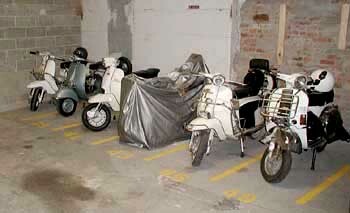 Many garages employed people who didn't know or didn't care one bit about motorcycles. Often "parking spaces" were merely places that the garage otherwise couldn't use to park a car. Bikes were frequently moved (and dropped) by employees. Likewise, security was minimal at best. I have heard many stories of parts and accessories disappearing from bikes parked in these facilities, including an entire brand new exhaust system. All this for less per month than any commercial parking in the area.